The first post in our DIY Walnut Coffee Table Build Series focused on the aesthetic and functional design aspects of the coffee table. In part two, we took a deeper look at the woodworking aspects of the design, focusing on the joinery techniques, and furniture hardware decisions. In part three, we finally get to start working with wood. We start by picking out lumber from the lumber yard, milling the lumber to our desired dimensions, and gluing up the panels for the coffee table. The first post in our DIY Walnut Coffee Table Build Series focused on the aesthetic and functional aspects of the coffee table. In part two, we take a deeper look at the woodworking aspects of the design, focusing on the joinery techniques, and furniture hardware decisions. Day 7 is my own home recipe // Honey Egg-White Yogurt Cucumber Face Mask. It’s a change from the scheduled Wine-Infused Face Mask, but I didn’t have red wine and wanted to work in a moisturizing and soothing face mask instead. Growing up my mom taught me how to take care and pamper my skin with DIY natural ingredients found in the kitchen pantry. My favorite is the Honey Egg White Yogurt Cucumber Face Mask. This DIY mask recipe has major benefits that will aid parched skin and fight against the environmental harm that inevitably affects the skin. Honey can aid in the relief of irritated skin because of its mild antiseptic and antibacterial properties. Egg whites contains many proteins, high in collagen, maintain the elasticity of skin and reduce the appearance of fine lines. (Remember to mix the egg white well enough to obtain a foamy egg white look). Yogurt can help moisturize and contains lactic acid that will smooth and gently exfoliate your skin while reducing fine lines and wrinkles by tightening the pores. Cucumbers aid and sooth sunburn, hydrate the eye area and cleanse the skin. Beat the egg white with a fork until it turns a little frothy. Tip: Coolest way to separate the yolk from the egg whites. In a bowl thoroughly combine the egg white, honey and yogurt. Apply the mask on your cleansed face and leave it for 15 minutes until you feel it dry. Gently rinse it off with warm water. Click here if you prefer to try the Birchbox Challenge Wine-Infused Face Mask instead. Birchbox teamed up with a panel of all-star experts to bring a 31-day challenge to make 2015 your healthiest, happiest, most gorgeous year ever. I’m joining Birchbox on this month-long challenge and will share my success with #BirchboxChallenge. Make sure to also enter for their daily prize giveaways. Let’s do this together! 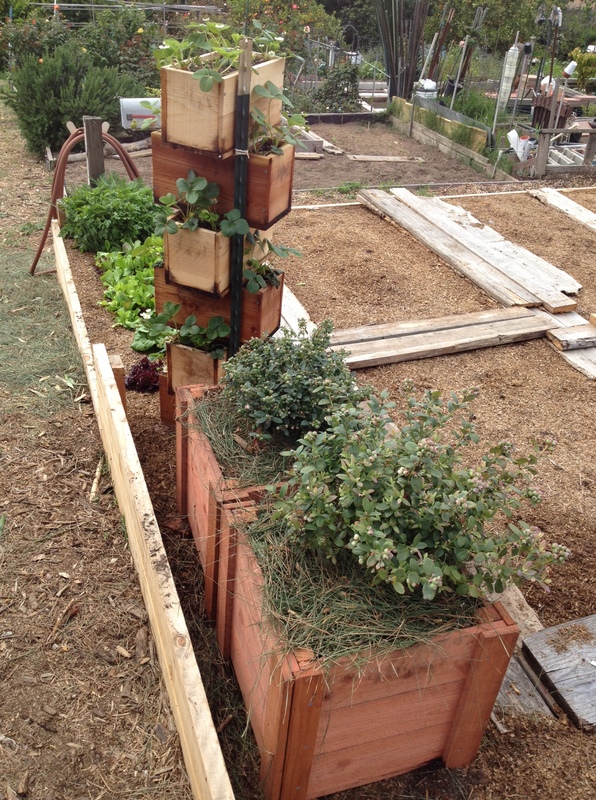 What do you get when you mix an urban gardener with an DIY-enthusiast? 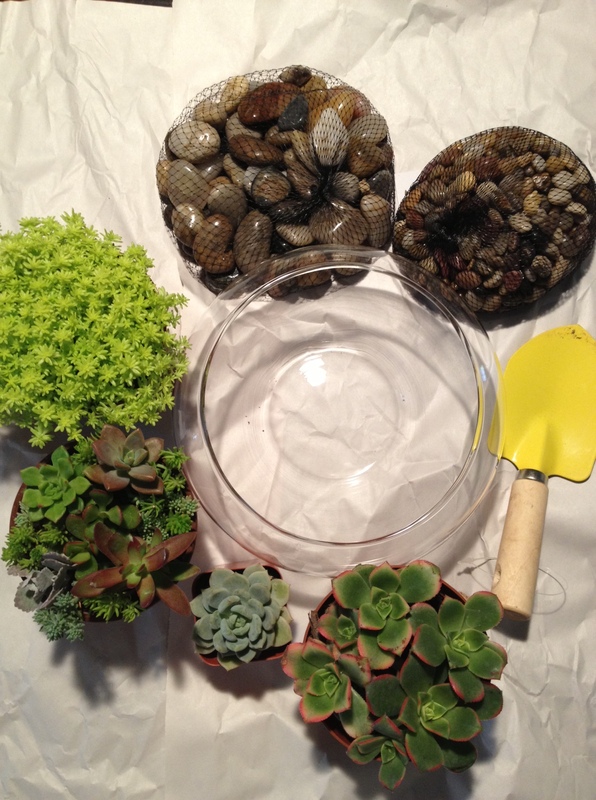 DIY succulent terrarium centerpieces! We spent an hour of our Sunday to create a few of these lovely centerpieces for our upcoming wedding. 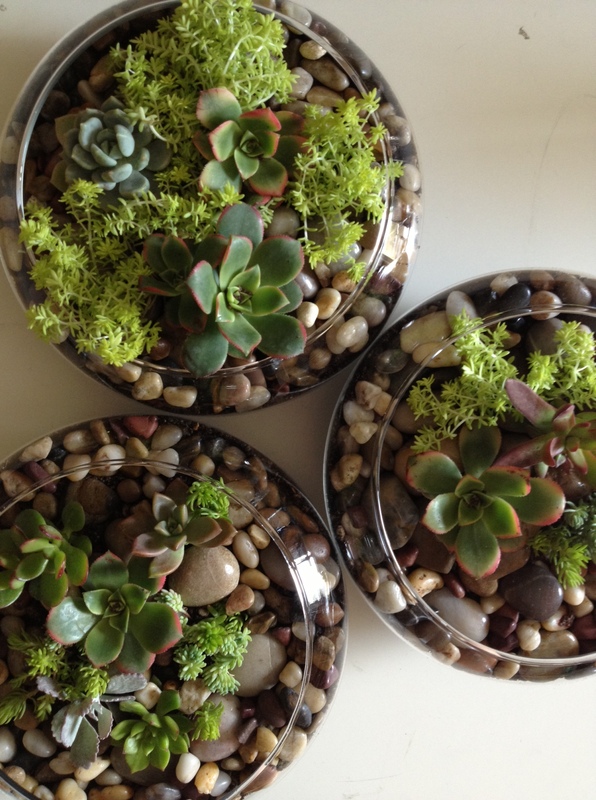 We’re still having our florist make some floral centerpieces, but felt creating these additional DIY centerpieces is a beautiful way to add a personal touch and share our love for succulents with our guests. (It’s also friendly to our wedding budget!) I’ve learned floral centerpieces can cost from $75-$200. 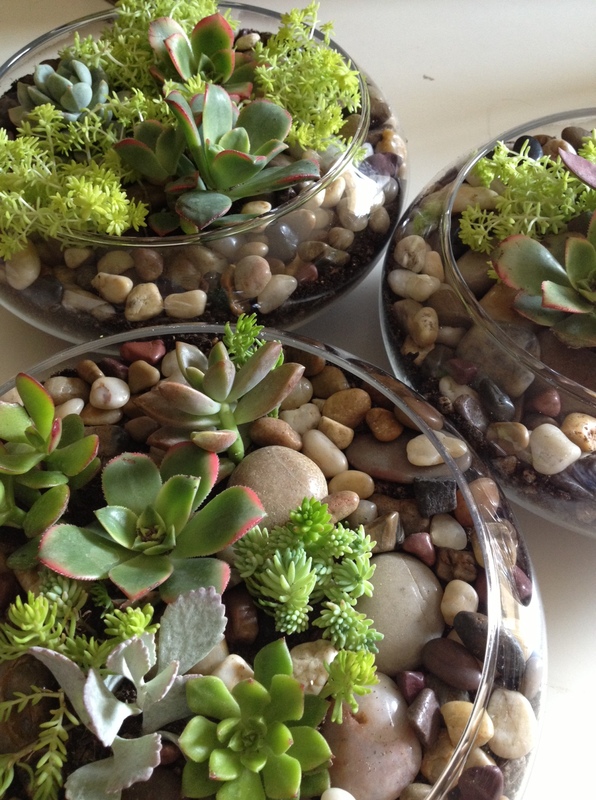 Materials to create these DIY succulent centerpieces cost about $15-$20 each. A succulent terrarium isn’t only for weddings, it can also add the finishing touch to a coffee table, low-maintenance greenery to a desk or even a unique housewarming gift! 1. Place a 1-inch layer of pebbles/river rocks on the bottom of container; this provides drainage so the plants won’t rot in standing water. 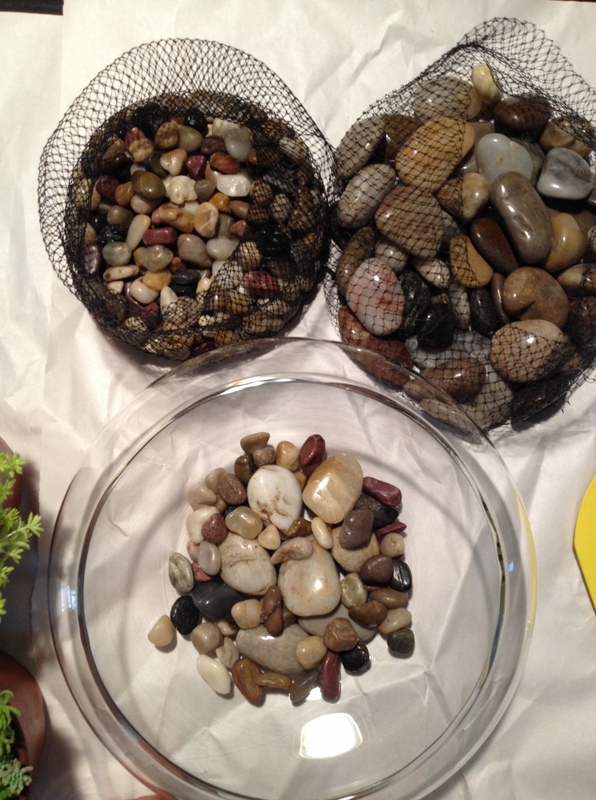 We used a mixture of large-size and small-size river rocks. We bought our glass containers from Michael’s craft store and succulents from our local garden nursery. 2. (Optional) Add a 1/2-inch of horticultural charcoal. 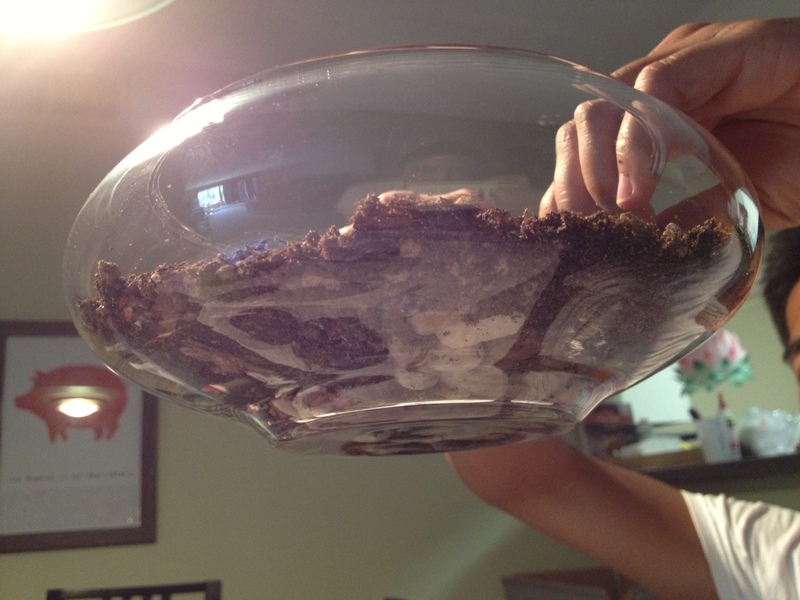 The charcoal will help keep the terrarium smelling fresh. Smooth out this layer too. We read it helps to rinse the charcoal before to prevent a layer of black dust from collecting on the inside of the vase. 3. 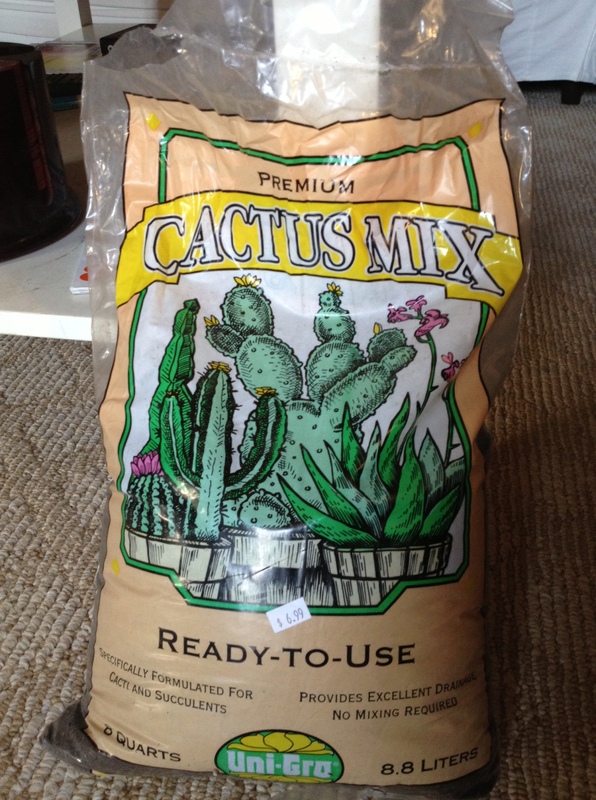 Place a layer of cactus mix soil, a fast-draining soil that retains little moisture. 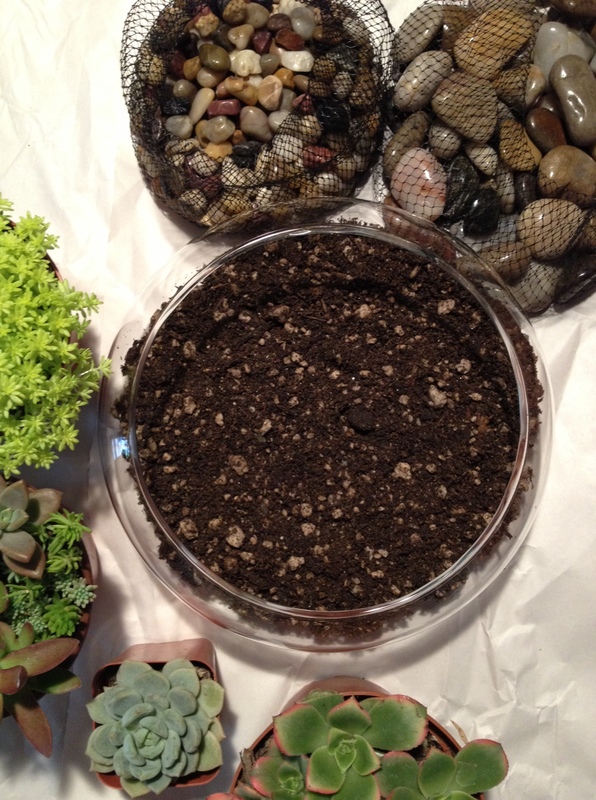 Use your little shovel or hand to level the cactus mix soil in your glass container. 4. Remove plants from pots. 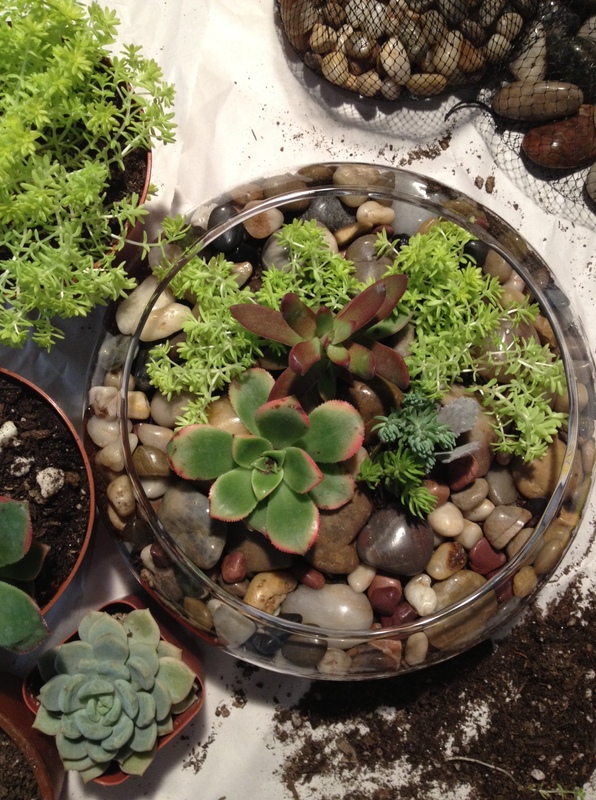 If you have multiple succulents in one pot, gently break them apart and use them separately. Scoop a little hole in the soil and place roots in soil. Gently add more soil around the edges of the container and around the base of the plants and pat around the roots. Sometimes the lanky, tall succulents have a difficult time standing up and tend to topple over. Pack more soil around them and strategically place some large-size river rocks around the base to create some stability. We used around 3-5 succulents per centerpiece. 5. 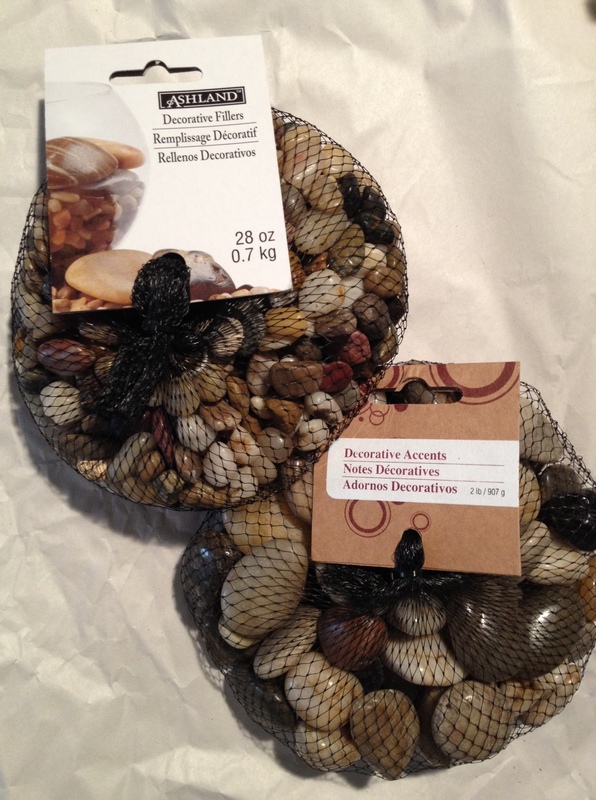 Finish the look by adding more river rocks on the top layer. Done! 1. Give the terrarium direct sunlight every day for at least five or six hours. 2. Water the terrarium every two weeks. Water lightly–don’t over water. 3. The water should lightly drain to the bottom. After watering, there should not be more than an inch of water visible in the gravel at the bottom. 4. Use your finger to touch the soil and check if it’s dry before watering. We still have to make more and look forward to shopping for more succulent varieties at our local nurseries! We had a craft attack last week. 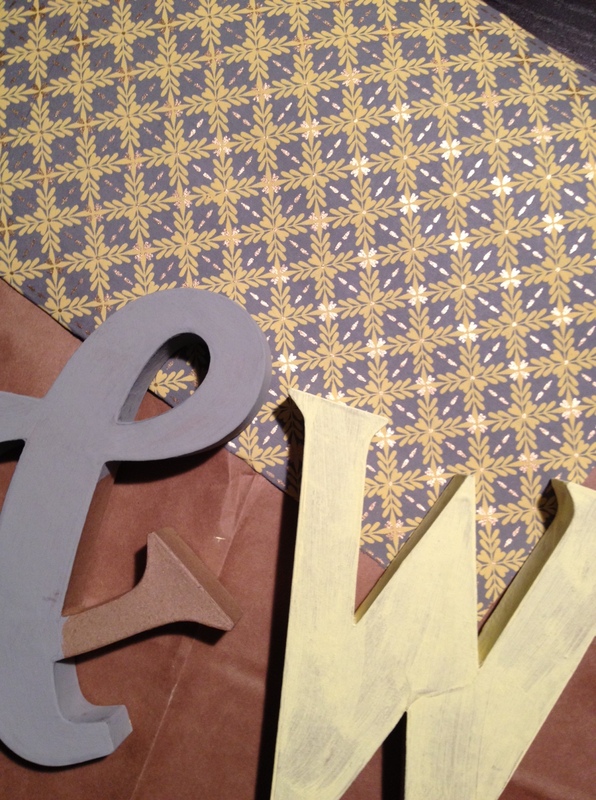 In preparation for our e-shoot we prepared decorative craft letters as props. We bought the paper mache craft alphabet letters from Paper Source. They sell the whole alphabet in capital and lower case letters (also ampersand)! They are lightweight and the perfect paper material to be creative. You can decorate with paint, glitter, paper–possibilities are endless! 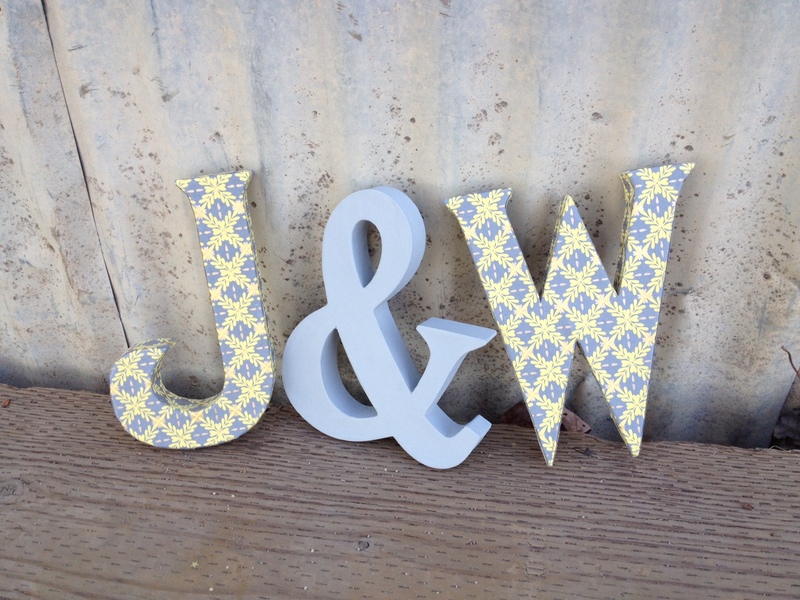 – Paper Mache Craft Alphabet Letters: We bought ours from Paper Source. – Pattered Paper: We bought a beautiful patterned sheet of paper from Paper Source. 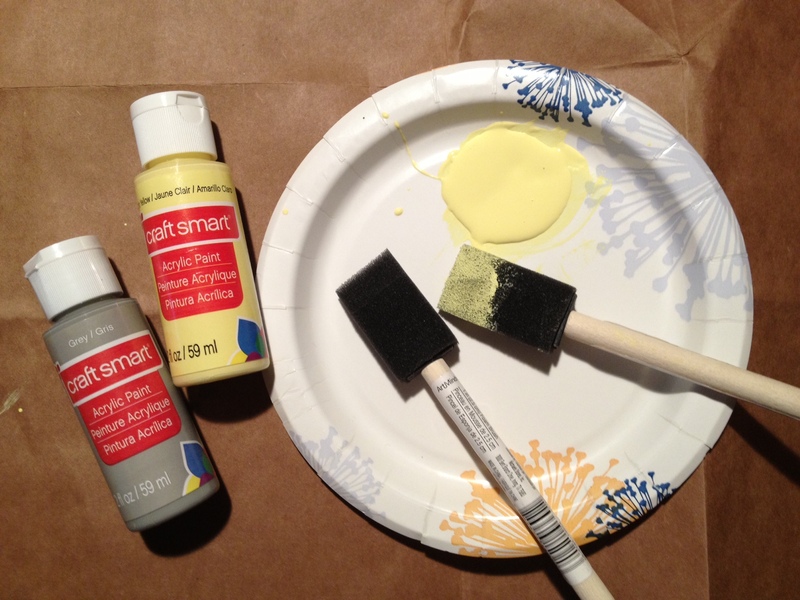 – Acrylic Paint: Colors that are similar to the paper you desire to wrap the letters in. – Glue: We used a fabric glue that was strong and quick dry. All-purpose glue should be fine. Total time: If you’re a perfectionist, around 3-4 hours. This is the tricky part. We lightly traced a dotted line of the letter (with a lead pencil) onto the front decorative side of the paper. We also turned the letter to it’s side and traced the side with a solid line. Then cut at the solid line and folded at the dotted lines. This way, there are “flaps” and that are folded. 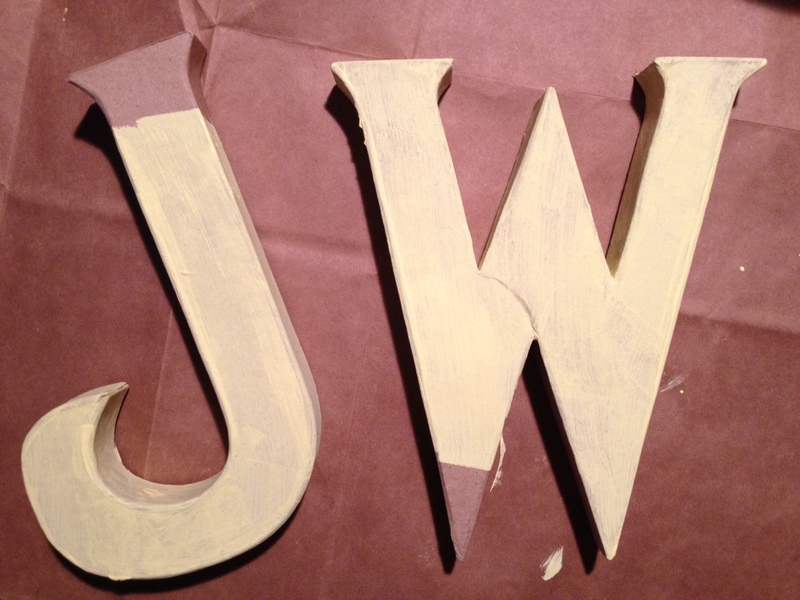 The flaps should cover the sides of the letter to create a seamless look on the front side. We went back and lightly erased the dotted lines since it was slightly visible. Then glue the paper cut-out to the paper mache. Repeat on the flip side. 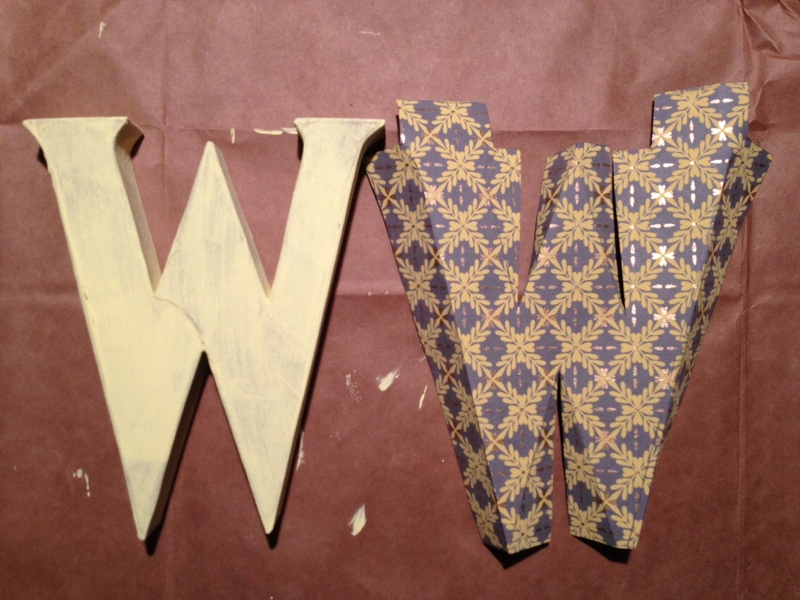 The inside parts of the “W” had open spots, so strips that were measured to the width of the letter were cut and glued for a seamless effect. For paper that extends off the edges, use a razor to lightly slice it off. We’ve been on the lookout for some medium-large planters to house the new blueberry bushes we got, but its been difficult finding good ones at a reasonable price. So we decided to build our own. Total cost ended up being around $25-$30 for a 18inch cube shaped planter. We could have used cheaper wood and reduced the price a bit, but we decided to use redwood for the weather and insect resistance. Instead of using redwood planks, we used 5.5 inch redwood fence boards. Fence boards are cheaper than redwood planks and they also have a more rustic, unfinished look. Cut from 5.5 inch wide redwood fence boards, but split length-wise so one piece is 3 1/8 inches and the other is 2 3/8 inches. We also used 16 2 1/2 inches exterior wood screws and 12 1 1/4 inch exterior wood screws leftover from a previous project. After cutting all of the required pieces, check the cut edges to make sure they are smooth and remove any sharp splinters. 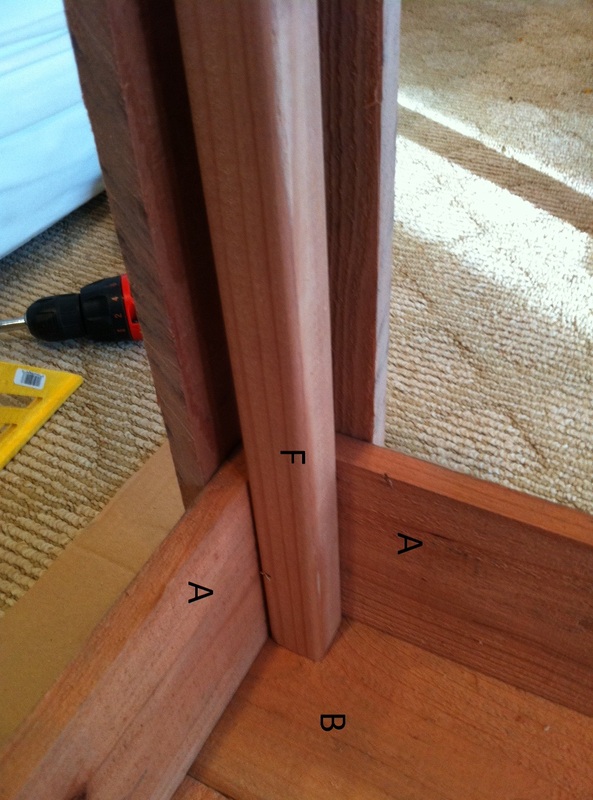 Then start by constructing the first corner, take two sides (A) and line them up with corner post (F). 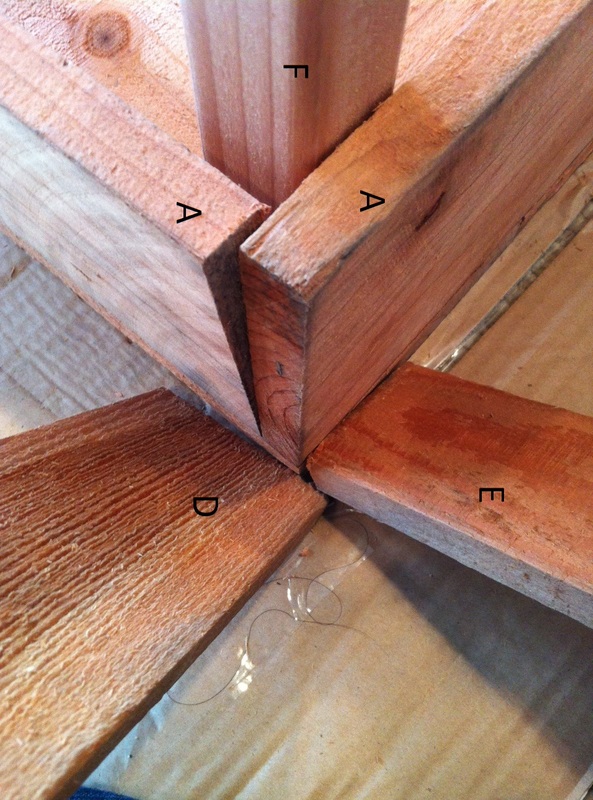 All three pieces should sit on top of a base piece (B) and be flush with the edges. DIY Redwood Planters – Step 1. Then take the two edging pieces (D and E) and arrange them as shown below (an extra pair of hands might come in handy here). You can also first screw in the sides to the corner posts, then attach the edging, but we were trying to save some screws. Be sure to drill pilot holes before driving the screws to make sure the wood doesn’t split. Pay close attention to how the seams overlap each other. The seam between the two sides (A) is covered by the edging piece (D). 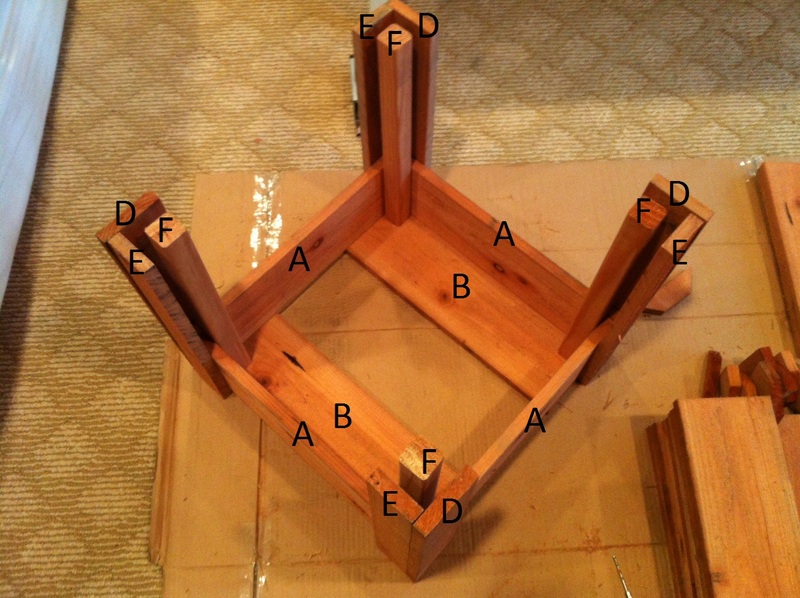 The side pieces (A) and corner post (F) should sit on top of a base piece (F). The edge pieces (D and F) should sit on the ground. DIY Redwood Planters – Step 2. Next, either clamp the pieces of wood together or have a friend hold them while they are screwed together using 2 1/2 inch exterior wood screws. Make sure you attach the screws in to the center of the corner posts for a solid connection. 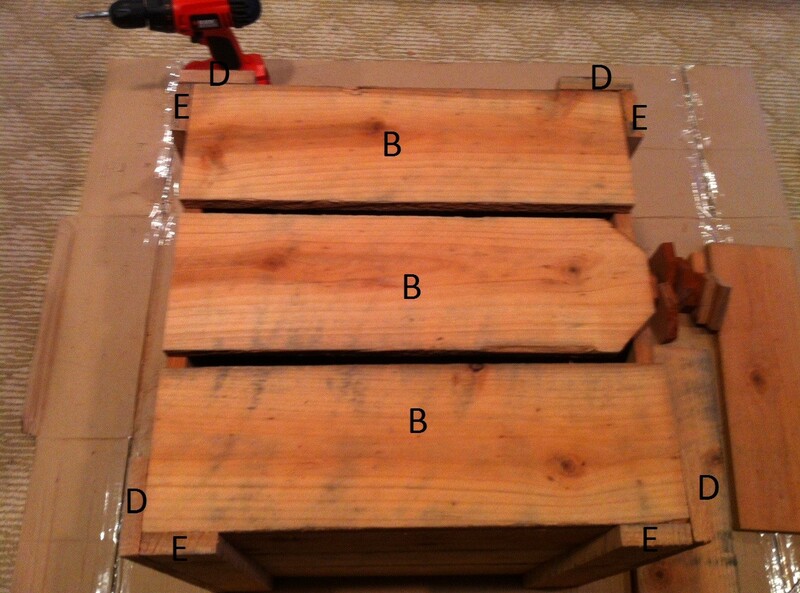 DIY Redwood Planters – Step 3. After the first corner is done, continue building the corners around the planter. 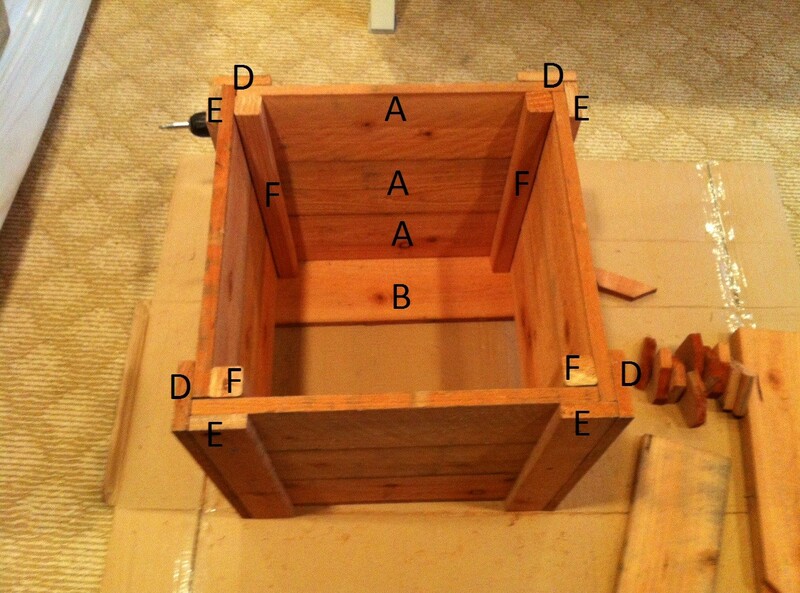 DIY Redwood Planters – Step 4. 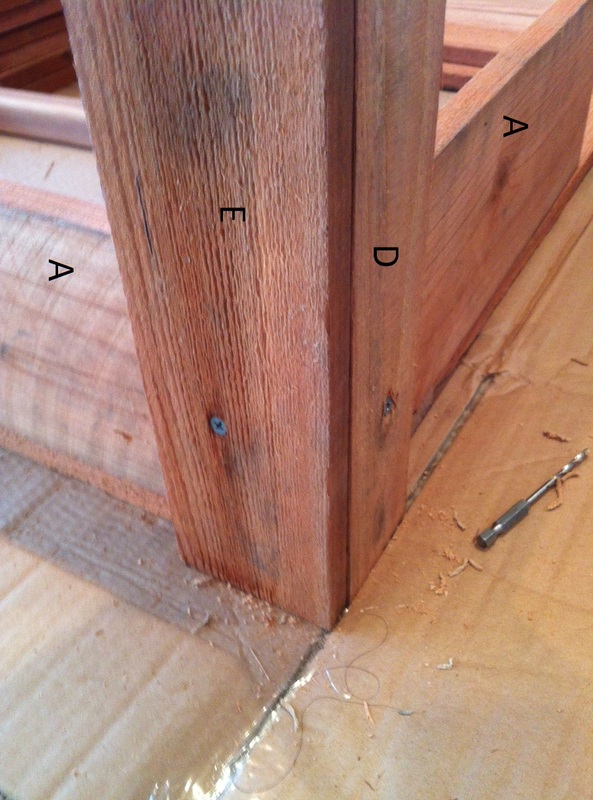 After all of the corners are completed, slide the remaining sides (A) down the grooves and screw in place. DIY Redwood Planters – Step 5. The final step is to attach the bottom boards (B). Lay out the boards so there is around a 1/2 inch gap between the three boards for drainage. Then screw in to place using a combination of the 1 1/4 inch screws along the edge and the 2 1/2 inch screws in to the corner posts (F). DIY Redwood Planters – Step 6. Now you are ready to plant! We planted blueberries so we could better control the soil since blueberries grow best in acid soil. DIY Redwood Planters in the garden. 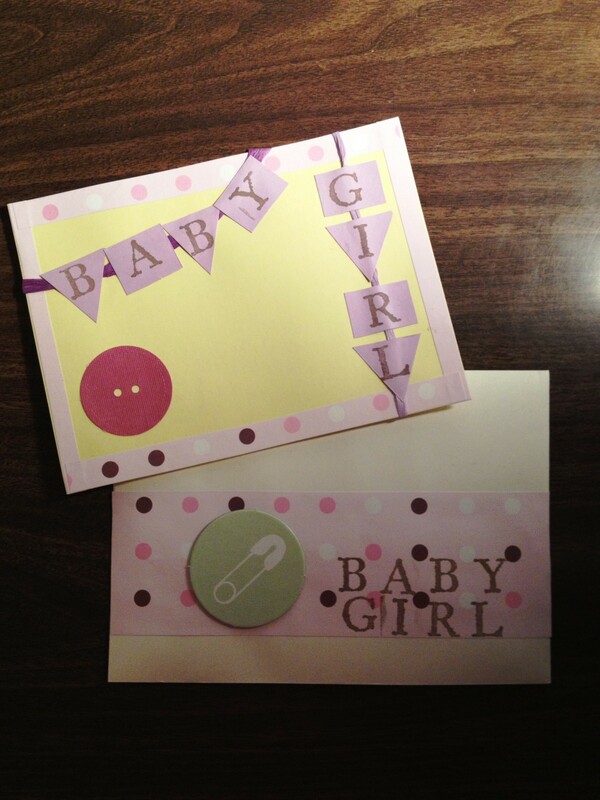 I recently handcrafted this baby card (almost) entirely from decorate scraps & materials I had lying around. I like to repurpose materials. Card:This is a postcard-type card (no bend or fold). 1. Take the colored card stock paper and cut dimensions that are slightly smaller than the envelope. Tip: Use a lighter color card stock paper because it’s easier to read the written message. 2. Framed border: Take scraps of patterned paper and measured the length and width of the card. Glue the strips to the edges of the card. 3. Words: Cut out square and triangle shapes and used letter stamps. (Handwriting the letters with markers work just as well, if letter stamps aren’t present) Make sure the shapes cut will fit on the card. 4. Stringed Look: I used 6″ of flat colored string . Before taping the ends behind the card, first place the string on the card to see where you like the letters to be placed. 5. Stamp the letters or write the letters on the geometric shapes. Glue them into place on the card. It’s ideal to first space them out to see the overall look before gluing. 6. Accents: Use your creative instincts to glue the cut-outs or stickers on the card/envelope. It’s always a nice touch to craft my own envelopes. I use this Paper Source template for envelope ($15) and liners ($12.50). Possibilities are endless. Welcome to It’s Jou Life ! Hi! 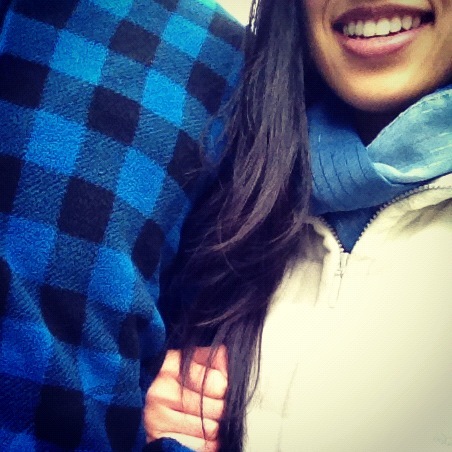 We’re Wayne and Jennifer, just two quirky people who found love in the most unexpecting place. This is our DIY / lifestyle blog–highlighting our smorgasbord of interests. Our friends always ask us how we grow our own organic vegetables, how did we make that cute zippered pouch, techniques for marathon training, what’s our recipe for zucchini bread, what to bring for a camping trip, what’s Jennifer’s favorite BB Cream brand? This is our way to share life’s loves. Here’s a glimpse into our quirky lives. Feel free to leave comments & suggestions, or even share this blog with others!